A Tesla Model S driver in Utah, Jared Overton, says that he parked his car behind a trailer before running an errand for a few minutes. When he returned to his vehicle, he says he found it crashed in the back of the trailer with the windshield crushed by the trailer’s bed – picture above. Following the unveiling of an updated version of its Model S earlier this week, Tesla has been contacting current Model S owners to invite them to a new event series called “Tesla Weekend Social”. 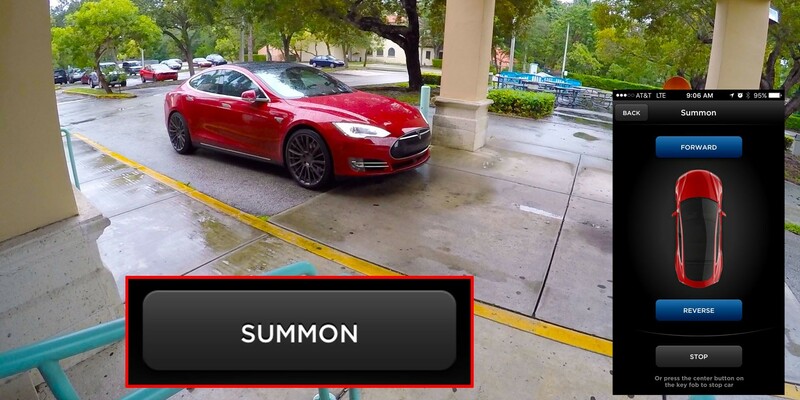 Over the weekend, app developer Touch Titans published a quick demo video (see below) of what it claims to be a “mind-controlled Tesla Model S”. Although a stretch and gimmicky, the statement is technically correct (if you consider simple brain activity to be your mind). Last month Tesla released its latest ‘Autopilot’ update (v7.1), which we covered intensively, but if you are not up-to-date with Tesla’s latest software, the Model S’ Autopilot now includes a new feature called ‘Summon’, which allows Tesla owners to remotely move their vehicle without anyone in it. At the moment, it is primarily used to get the Model S in and out of a garage easily, but in the future, Tesla CEO Elon Musk says you will be able to summon your car from across the country and it will come meet you while charging at Tesla Superchargers along the way.